Our Birthstone Bracelet Series completed a full year -- started February 2017 and ended January 2018 -- and we are now putting together a Series 2. Many months have more than one birthstone, and there are other birthstones based on other cultures and ideas. 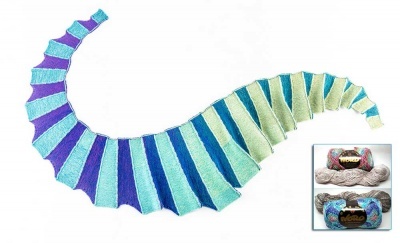 We thought it would be fun to see what we could create to expand on the birthstone bracelet idea. We might not have a Series 2 creation every month but we'll periodically have something special to show you. 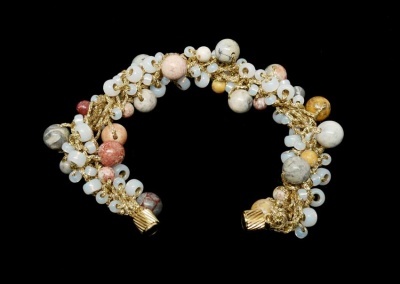 Jasper is an alternative birthstone for March, more specifically for the zodiac sign Virgo. This stone offers a unique and different type of appeal than most other stones. It occurs in almost every color including brown, red, green, pink, yellow, white, shades in purple but rarely blue. Its name originated from the Old French word 'jaspre' which means 'spotted or speckled stone'. Jasper is an opaque rock that displays combination of patterns, colors and bands, sometimes seeming to show an image from nature, resembling valleys or mountains. 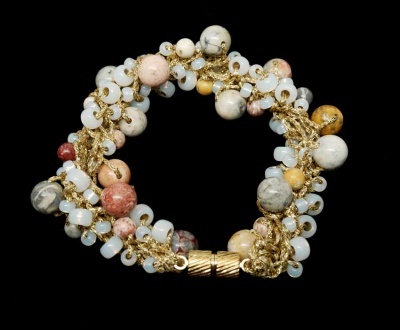 Jasper is said to facilitate tranquility, help eliminate worry, ease depression and bring mental clarity. What we brought in are 4mm and 6mm stones called Mexican Sky Eye Jasper, a lovely mix with swirls and speckles of color -- lavender, green, pink, orange, red -- on an opaque creamy beighe or gray backgound.. These beads have intriguing markings, including, on some, roundish "eye" shapes that are especially lovely. The colors are such that they would look good with either gold thread (and clasp) or silver -- you can choose via the drop-down menu. The one you see here used gold as the base. 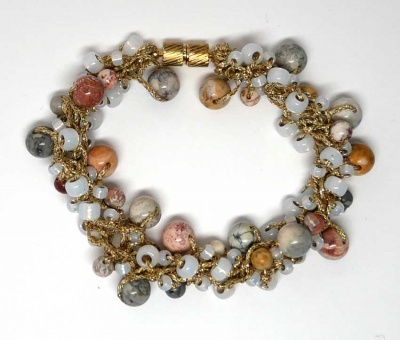 The jaspers were alternated with 8/0 and 6/0s beads in Gilt Lined Opal in a particular order, and knit to form a thin band that twirled upon itself. We finished it off with a magnetic clasp -- if you would prefer a toggle clasp, we offer that option as well. The clasp will, of course, mirror the thread color you choose. 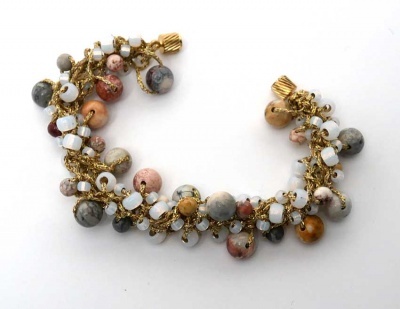 We chose the same pattern that we used for our Agates of May bracelet last year (sold out, alas), a variation of the design we used in our Fire Polish Crystal Swirls. I know some of you might already have made other bracelets of ours that are made along the same lines . If you feel you do not need another pattern, simply choose "No Pattern Needed."